Once again, the time is right for an update regarding the essential aspects of this topic. Sedation for gastrointestinal endoscopy is a subject of increasing interest and controversial debate, reflected in a growing number of nationwide surveys and international observational studies  . The published studies and surveys assess the status quo of current sedation practice and the frequency of sedation-associated complications. Particular emphasis is placed on the newer, short-acting sedatives such as propofol. Single-unit data regarding specific issues of sedation (e. g. safety of propofol sedation in elderly, high-risk patients ), are of clinical importance as they might prompt further studies and guideline reviews, as well as stimulating the development of dedicated sedation training courses. The introduction of short-acting sedatives has improved patient comfort in gastrointestinal endoscopy and increased the acceptance of surveillance colonoscopy . It is not surprising, therefore, that there are a rising number of studies investigating the need for changing sedation practice in order to optimize the cost-value ratio in the clinical and outpatient setting. The results of a recent survey in the United States, which was sent to 5000 members of the American College of Gastroenterology and with responses from 1353 members (27.1 %) , showed that there has been a twofold increase in the number of esophagogastroduodenoscopies (EGDs) carried out, and a three- to fourfold increase in performed colonoscopies compared with a similar survey conducted by the American Society for Gastrointestinal Endoscopy (ASGE) in 1989 . The use of intravenous sedation using an opioid in combination with a benzodiazepine is still standard practice for three-quarters of the respondents. However, midazolam has almost completely replaced diazepam, and is currently the most frequently used benzodiazepine. The use of fentanyl and meperidine has changed little since the 1989 survey. The advantage in application of these agents compared with the more traditional opioids is their short-acting properties, enabling a rapid recovery time and causing fewer side effects. Propofol was used by 25 % of the interviewed endoscopists, most of whom were assisted by an anesthesiologist. This usage varied geographically from 43 % to 7 % according to the local health insurance policies regarding the coverage of anesthesia in endoscopic procedures. The current survey showed an increasing presence of an anesthesia provider in 28 % of all endoscopic procedures, compared with 3 % in 1989 . One of the reasons might be the increasing usage of propofol. Propofol sedation has consistently shown higher satisfaction scores compared with conventional sedatives, but concerns about sedation-related complications and legal issues remain an important issue. It is not surprising, therefore, that only 7.7 % of the survey respondents administer propofol themselves without an anesthesiologist present, although 68 % were interested in the use of propofol if they and their staff were adequately trained. Monitoring of the patients has routinely included vital signs and pulse oximetry in about 99 % of the endoscopy units. Oxygen supplementation during all EGDs was performed by 72 % of the respondents. Although a registered nurse assisted during endoscopy at most centers (about 90 %), the responsibility regarding dosage and timing of sedatives was taken by the endoscopist. Do we really have to be afraid of possible complications of propofol, and will this lead to a reverse development of continued usage of standard sedation regimens with benzodiazepines and opioids? In a meta-analysis of 12 original studies, Qadeer et al. assessed the cardiopulmonary complications (hypoxemia, hypotension, arrhythmia, and apnea) for EGD, colonoscopy, and endoscopic retrograde cholangiopancreatography (ERCP)/endoscopic ultrasonography (EUS). Pooled odds ratios were calculated for all the procedures combined and then separately for the three groups. Compared with traditional sedative agents, the pooled odds ratio for developing hypoxemia or hypotension under sedation with propofol was 0.74 for all the procedures combined (95 % confidence interval [CI] 0.44 - 1.24). For EGD the odds ratio was 0.85 (95 % CI 0.33 - 2.17); for colonoscopy, 0.4 (95 % CI 0.2 - 0.79); and for ERCP/EUS, 1.07 (95 % CI 0.38 - 3.01). 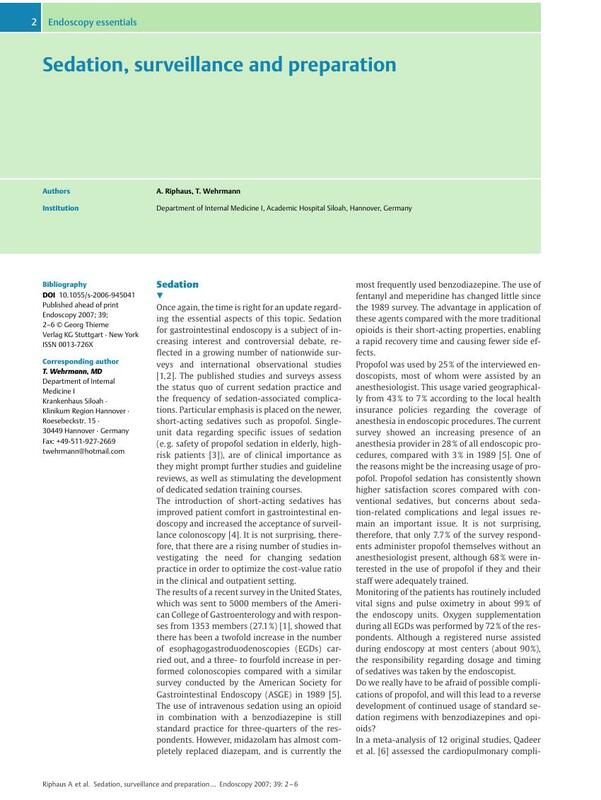 Combining all results, the overall risk for cardiopulmonary complications seems to be less with propofol (14.5 %) compared with other agents (16.8 %): However, one has to bear in mind that this observation is particularly true for diagnostic endoscopic procedures, as more interventional procedures (e. g. ERCP, endoscopic mucosal resection and/or EUS) were clearly underrepresented in this meta-analysis. On the basis of the currently available data, it appears that concerns about propofol sedation (e. g. hypotension, respiratory depression, apnea, and the lack of a reversal agent) seem to be overrated. Cost-saving alternatives to anesthesiologist-provided propofol sedation will be a consequence of the safety profile of propofol sedation. In a recent study by Rex et al. , the existing data    regarding the safety of administration of propofol by trained registered nurses were confirmed. In 36 743 patients at three endoscopy units (two in the USA, one in Switzerland), there were no cases of endotracheal intubation. There was no significant difference in the need for assisted ventilation by bag mask, which ranged from < 1 per 500 cases to < 1 per 1000 cases among the three centers. Furthermore, none of the patients had clinically significant cardiovascular complications. These results suggest that nurse-administered propofol sedation (NAPS) can be safely performed, subject to the condition that the endoscopy staff are sufficiently trained. NAPS was, however, less likely to result in respiratory depressions when used for lower rather than upper gastrointestinal endoscopy, despite lower mean propofol dosages for the upper gastrointestinal procedures. Because of this, the authors consider that colonoscopy and sigmoidoscopy should form the main focus at the beginning of NAPS training. Furthermore, an increased frequency of sedation-related complications was seen with higher doses (≥ 395 mg) of propofol in one endoscopy unit. Clinicians should therefore pay special attention to patients receiving higher propofol dosages during, for example, more complex or longer procedures. In total, the currently available data on NAPS show that more than 80 000 patients have to date received NAPS for endoscopic procedures without the need for endotracheal intubation, and there have been no reported cases of death   . However, as discussed by Rex et al. , the professional societies of anesthesiologists and nurse anesthetists have taken a position against the use of propofol by nonanesthesiologists , even though an evidence-based guideline for sedation by nonanesthesiologists issued by the ASA did not proscribe the use of propofol by nonanesthesiologists . Overall, four surveys from the United States  and the United Kingdom    found sedation-related mortality rates with endoscopist-administered narcotics and benzodiazepines of approximately one per 3000 to one per 11 000 cases. In a survey from Switzerland, no deaths were recorded in approximately 69 000 cases under this sedation regimen . Nevertheless, it is noteworthy that the Food and Drug Administration’s reporting of 73 deaths from oversedation with midazolam in the 4 years after its introduction  did not lead to concerns regarding its administration by nonanesthesiologists, as has been the case with propofol in the past years. As noted by Rex et al. , one potential standard to evaluate NAPS-related mortality is anesthesia-related mortality for surgical procedures (i. e. anaesthesiologist-administered anesthesia). Three reports from the United States , Japan , and The Netherlands  found anesthesia-related deaths in surgical cases to be > 1 per 50 000, and as high as 1.4 per 10 000 cases. These data should be considered before prejudices against propofol sedation by nonanesthesiologists are given too much weight. In this context it is important to stress that current data on NAPS have consistently shown it to be a safe and cost-effective method of sedation. Prerequisites for this high safety profile of NAPS are systematic training and re-evaluation programs. Another important study on the safety of NAPS was the prospective study by Tohda et al. , which evaluated the efficacy and safety of NAPS during emergency upper endoscopy for gastrointestinal bleeding. A total of 120 patients with acute upper gastrointestinal bleeding received propofol sedation by a trained nurse. Among these, 15 patients were classified into ASA class IV, 84 patients as class III, and 21 patients as class II. The control group consisted of 120 patients without acute gastrointestinal bleeding, who underwent upper endoscopy during the study period. Although the frequency of hypotension (systolic blood < 90 mmHg) was statistically significantly greater in the study group (8.3 %) than in the control group (3.3 %), there was no statistically significant difference between the two groups regarding the mean decrease in systolic blood pressure. The occurrence of bradycardia (heart rate < 50 bpm) was nearly the same in both groups (2.5 % vs. 1.7 %). There was no statistically significant difference between the two groups in the frequency of hypoxemia (peripheral oxygen saturation, SpO2 < 90 %). Transient hypoxemia could be managed by an increase in oxygen supply; none of the patients required assisted ventilation by bag-mask. All study patients were evaluated by chest radiograph for aspiration pneumonia, which occurred in two patients (1.7 %) at the beginning of the procedure. Another patient, with a pre-existing liver cirrhosis, died from hepatic failure 35 days after endoscopic hemostasis for esophageal variceal bleeding. No sedation-related deaths or serious complications were reported, even in high-risk-patients, 44.2 % of whom were aged ≥ 70 years. It must be noted, however, that the results from Tohda et al. cannot be generalized, because the number of bleeding episodes from peptic ulcer disease are overrepresented compared with the frequency of episodes of variceal bleeding, if translating these results to the situation in Western countries. The proportion of elderly people in this study particularly reflects the demographic development of an increasing number of elderly people, with high co-morbidity rates but needing interventional endoscopic procedures. However, the safety and efficacy of propofol sedation during ERCP in such populations has not been evaluated in controlled trials. Our group  reported in a recent randomized, controlled study, that sedation with propofol for routine ERCP is superior to midazolam/meperidine, even in high-risk octogenarians. A total of 150 patients aged ≥ 80 years and with high co-morbidity (91 % with ASA score ≥ III), randomly received midazolam plus meperidine (n = 75) or propofol alone (n = 75). Vital parameters, recovery time, and quality of recovery, as well as patient cooperation and tolerance of the procedure were all assessed. Relevant changes in vital signs were observed with comparable frequencies, with a temporary oxygen desaturation (< 90 %) occurring in eight (11 %) patients in the propofol group and in seven patients (9 %) receiving midazolam/meperidine (n. s.). A noteworthy drop in the systolic blood pressure < 90 mm Hg was documented in six patients (8 %) in the propofol group and in four patients (5 %) receiving midazolam/meperidine (n. s.). Changes in vital signs were without substantial sequelae. Under careful monitoring, the use of propofol sedation during ERCP is superior to the combination of midazolam plus meperidine, even in high-risk octogenarians. On the basis of these results and other studies that confirm the safety and efficacy of endoscopy procedures, such as EGD, colonoscopy and ERCP   , the ASGE guidelines were modified for endoscopic practice in the elderly . Because of the age-related changes of physiologic processes, with an increase in sensitivity and sedation risk in geriatric patients , administration of fewer agents at a slower rate and a lower cumulative dose is recommended. One means discussed for minimizing sedation-related risk is the performance of endoscopy with minimal or no sedation, using ultrathin endoscopes     . One of the advantages of this technique is the reduced likelihood of oxygen desaturation and arrhythmias during the procedure  .